Hosting the perfect Asian wedding can be complicated – the guest list can often grow (and grow!) and finding a venue that can accommodate a large wedding party comfortably can be a tricky business. 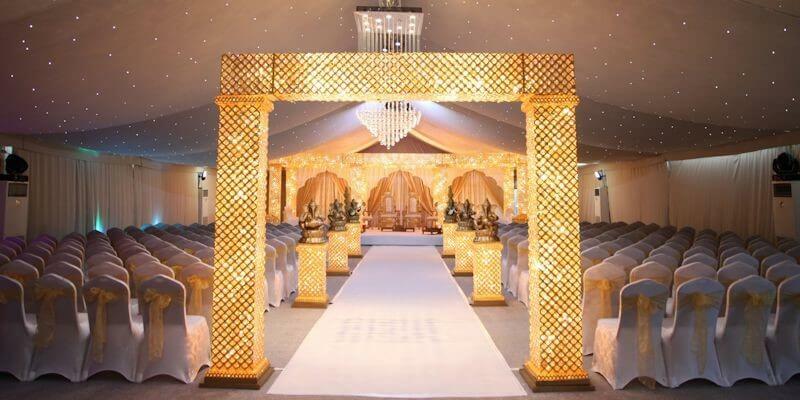 Here at Allianz Park, we are proud to say that we are well practised in holding numerous Gujurati, Punjabi, Sikh and Muslim weddings with our in-house team on hand to hold yours throughout the planning process. Our experienced team understand that each celebration is different and will work with you to create the perfect day, whilst ensuring that tradition is upheld throughout. With Asian weddings combining wonderful food, décor and tradition – a venue that can be flexible in all of these areas is also essential. Couples have the choice of several event spaces at Allianz Park with the largest being our Olympic Bar which can accommodate up to 2,500 for a standing reception. The Allianz Suite can host a seated wedding breakfast option of up to 1000 guests and offers couple a blank canvas to theme in whatever wonderful and colourful way they choose! The in-house catering team are highly experienced at providing menus for all kinds of multi-cultural weddings and will with you to create the perfect menu to tickle all taste buds and satisfy all dietary requirements. Bringing a large group of friends and family together isn’t always easy – location is key and finding a venue that is well situated and close to major transport links is integral to ensuring as many guests can attend as possible. Our north London location ticks this box – situated only five minutes from the M1, A1 and with 800 free car parking spaces at your disposal. For those guests needing overnight accommodation, we are also able to recommend local hotels to lay their weary heads once the celebrations have come to an end!